As a mom of a little kid, sometimes the only relaxing moments to myself are when I'm driving in the car. This is when I catch up on my podcasts and listen to my music (when he's sleeping...otherwise we jam to our CD from Music Together!). On a recent busy day, while Weston napped in the car, I decided to get a McDonald's iced tea, and pop a new album into the CD player. Luckily, I was just sent Annalise Emerick's new album, Field Notes; we've posted about how much we love her music before, so I was thrilled to open the CD and get a first listen. Let me tell you, simply put: this is an album for the books. Man, is it good! Not only does she have a soulful and gorgeous voice to listen to, and her music style is dead-on, but her lyrics had me tearing up! "The sun has been up for hours, and the moon, I can see up there too, and you're still still far away in dreamland, but me I'm just looking at you. I used to be so scared, and I'd sing about terrible things but you, you make it so easy, your love gave me my wings. Cause you are the sun and I am the moon, you shine so bright and I like the night." At this point in the car ride, I was totally crying...I mean, it's a gorgeous song and will you just look at those lyrics?! Moving on to the rest of the album, I soaked up all the music and lyrics...and listened to the album about three times in one day. Good One is the sweetest love song, and I can tell is going to become an indie-wedding standard in due time. Born This Way is an amazing anthem to the strong, adventurous and go-getter woman...it has some cool piano in it, making it feel a little Old West Saloon--which I happen to love! Annalise is a little bit Carly, a little Carole, Patti, Emmylou, and a really intelligent version of Taylor Swift (that's a complement!). She's a story teller of Paul Simon caliber, and writes music which will stay in her listener's hearts forever. I highly recommend Field Notes (pre-order the album here! ), just try to listen when you can really hear and understand the lyrics--they are worth every word! 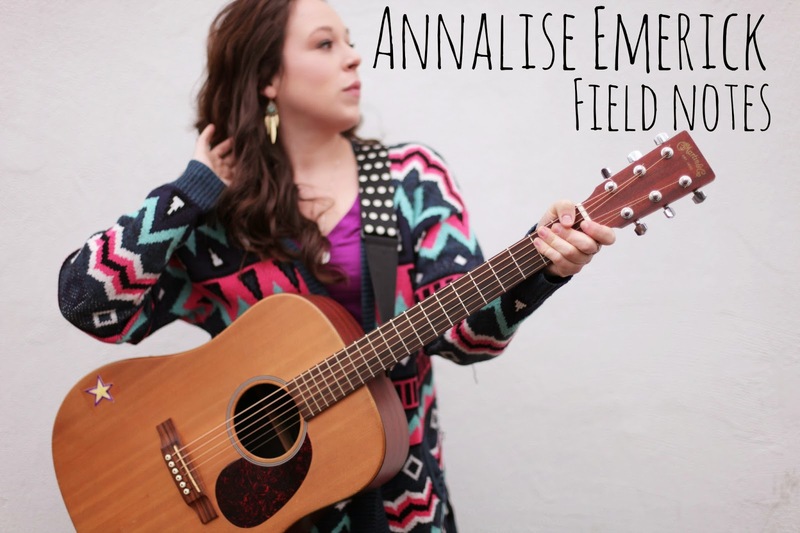 Annalise is currently touring, so be sure to check out her tour schedule and catch a show!